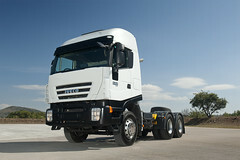 • Chassis cab with single wheels at 3.5t GVM. Predominantly for urban use, its compactness and agility make it an ideal vehicle for missions such as temperature controlled transport. • Chassis cab with twin rear wheels from 5t to 7t GVM. An unrelenting champion of profitability for all missions requiring high structural rigidity (from roadside assistance to its countless applications in the construction sector). • Crew cab with twin rear wheels at 6.5t and 7t GVM. With seating for up to 6 passengers + driver, is particularly useful for civil engineering, recovery vehicles, building and municipal purposes.